This 4 bed freehold detached house is located at Boughspring Barn, Hanley Lane, Boughspring, Chepstow NP16 7JH and has an estimated current value of £630,000. Hanley Lane has 3 properties on it with a average current value of £627,841, compared to an average property value of £311,741 for NP16. There has been 1 property sale on Hanley Lane, NP16 over the last 5 years with an average house price paid of £620,000 and this detached house was last sold on 17th Feb 2017 for £620,000. There are currently 115 houses and flats for sale in NP16 with an average asking price of £486,553 and 19 homes to rent in NP16 with an average asking rent of £185 pw. Boughspring Barn offers spacious family accommodation with this stone faced detached build situated in a picturesque rural setting with gardens and grounds of around 3 acres and fantastic views to the River Severn and surrounding countryside. The property briefly comprises a spacious reception hall giving access to large living room with feature fireplace and wood burner, access to conservatory maximising surrounding views, a separate formal dining room with dual aspect, kitchen/breakfast room, ground floor w.C. And utility room. To the first floor are four double bedrooms, the master of which benefits from jack and jill en-suite, also utilised as family bathroom. The property also benefits from a partially converted attic space, with a generous circulation area with good head height, one window, offering a fantastic potential for conversion with the necessary consent. Outside the property benefits from one and a half acres of formal ornamental gardens with a further one and a half acres of grounds. 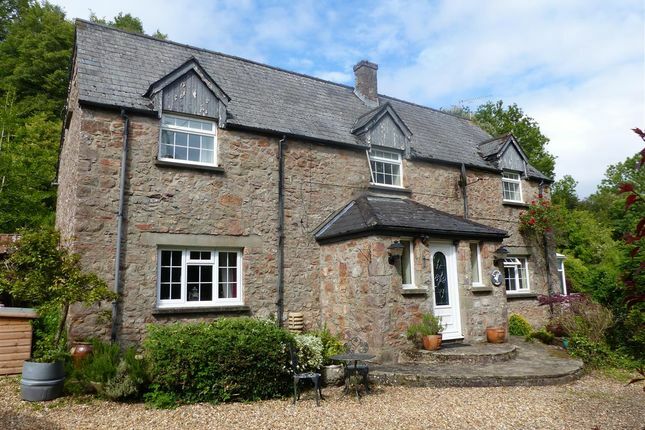 Also set in the grounds is a stone faced detached annexe with reception hall, w.C., living dining room and kitchenette as well as double bedroom with en-suite, which could also be utilised as a holiday let. There is also a garage, again which is stone faced, with power, lighting and water supply. Being situated in the sought after location of Tidenham, a number of facilities are close at hand to include local farm shop, primary and secondary schools in nearby Woolaston and Chepstow. There are a further range of facilities in Chepstow to include pubs, restaurants, doctors and dentists. Being situated near the A48, the M4 and M48 motorway networks are close at hand, bringing Gloucester, Newport, Cardiff and Bristol within easy commuting distance. With upvc double glazed front door and double glazed window to front elevation. Solid wood block flooring. Exposed timber beams. One double panelled radiator. Access to first floor. A spacious reception room with solid wood block flooring, exposed timber beams. Feature stone fireplace, multi-fuel burner. Upvc double glazed window to front elevation. One double panelled radiator. Access to conservatory via upvc double glazed sliding door. A upvc double glazed conservatory with rendered plinth. Ceramic tiled flooring. Fantastic views towards River Severn and surrounding countryside. Upvc French doors leading to gardens. Also accessed from reception hall with upvc double glazed windows to front and rear elevations. Exposed timber beams. Two double panelled radiators. Comprising a white suite to include low lever lever flush w.C., pedestal wash hand basin with chrome double taps. Part ceramic tiled walls. Ceramic tiled flooring. Upvc double glazed window to side elevation. Appointed with a matching range of base and eye level storage units with granite effect work tops. Integrated high level oven and grill. Space for dishwasher and fridge freezer. Inset five ring gas hob. Multi-fuel burner linked to hot water. One and a half bowl and drainer sink, chrome mixer tap. Ceramic tiled splashbacks. Porcelain tiled flooring. Timber glazed double doors leading to rear lobby/utility area. Two upvc double glazed windows to side elevation. One double panelled radiator. With ceramic tiled flooring. Oil fired boiler. Timber glazed door to gardens. Window to rear elevation. A spacious master with a range of fitted wardrobes. Upvc double glazed window to side elevation, one to front with fantastic views. One single panelled radiator. Access to Jack and Jill en-suite. Accessed from master bedroom and landing. Comprising a white suite to include low level dual push button flush w.C. And wash hand basin with chrome mixer tap set into corner vanity unit with mirror and light over. Panelled bath with chrome mixer tap and shower attachment. Double shower cubicle with chrome mains fed shower. Part ceramic tiled walls. Ceramic tiled flooring. Chrome heated towel rail Upvc double glazed window to side elevation. Spotlighting. A generous double room with upvc double glazed windows to front and rear elevations. One single panelled radiator. A double room with upvc double glazed windows to side and rear elevations. One single panelled radiator. Currently utilised as study with over stairs void storage cupboard. Upvc double glazed window to side elevation with fantastic views. The property is approached via gravel driveway with stonework pillars and gated access, leading to large parking area. The gardens are laid to lawn with a number of mature shrubs and trees with three natural ponds as well as large woodland area to the rear. The formal gardens approach one and a half acres with a further one and a half acres of field, accessed via five bar gate, also with water supply. Large store shed and poly tunnel to remain(Please note poly tunnel cover needs replacing), again with water supply. Also situated in the grounds are a detached annexe and garage. The annexe briefly comprises a stonework faced build with reception hall, w.C., open plan living/dining room with vaulted ceilings, kitchenette, a double bedroom again with vaulted ceilings and access to en-suite. With quarry tiled flooring giving access to w.C. And living/dining room. Comprising a white suite to include low level lever flush w.C., pedestal wash hand basin with chrome double taps. Part ceramic tiled walls. Quarry tiled flooring. Timber glazed window to side elevation. With vaulted ceiling. Exposed timber beams. Feature fireplace. Timber double glazed sliding door to front paviour terrace. Electric storage heating. Access to kitchenette. Appointed with a range of base and eye level storage units with space for cooker and fridge. Stainless steel one bowl and drainer sink. Chrome mixer tap. Ceramic tiled splashbacks and ceramic tiled flooring. Timber glazed window to side. A double room with vaulted ceiling, exposed timber beams. Timber glazed window to front elevation. Storage into loft/eaves. Access to en-suite. A suite comprising low level lever flush w.C., pedestal wash hand basin with chrome mixer tap. Shower cubicle, fully tiled with electric shower. Part ceramic tiled walls. Ceramic tiled flooring. Electric chrome heated towel rail. Airing cupboard. Attached to the annexe is a garage with timber doors. Power, lighting and water supply. Mezzanine floor for further storage. From our Chepstow office, proceed along the A48 in the direction of Lydney, taking the left hand turn immediately after Hanley Farm Shop. Proceed along this lane and the property is around 3/4 of a mile on the right hand side. Oil fired central heating linked with wood burner for hot water and heating. Septic tank. Mains water and electricity. You are recommended to have this verified by your legal advisors at your earliest convenience.